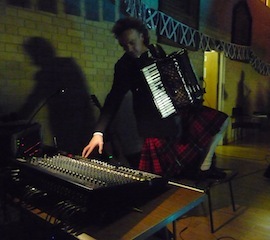 Vicki & Jonny can provide a ceildih band in conjunction with the Millrace Ceilidh Band. A simple two piece plus caller (Jonny on Guitar and Vicki on Flute) with Alan as caller. Full five piece band line up of Violin, Flute, Accordion, Mandolin and Guitar plus caller. Full PA and lighting included.